There is no doubt that some people think we are crazy. There are also those out there who are more than a little envious of our lifestyle. We’ve always want to live our lives with as few ‘if-onlys’ as possible. We didn’t want to sit back in our dotage and wish we’d done the big trip and regretted not doing it. There may be no tomorrow so you have to live life to its fullest. When Shirley’s sister died of cancer there were many ‘if-onlys’ in her life. She was cut down in her prime with so much left to do – so much life to live. Brian has owned and ridden motorcycles for more than 40 years, starting off riding paddock bikes around his father’s farm near Mildura (Victoria). His back yard was about 90 miles of river frontage. 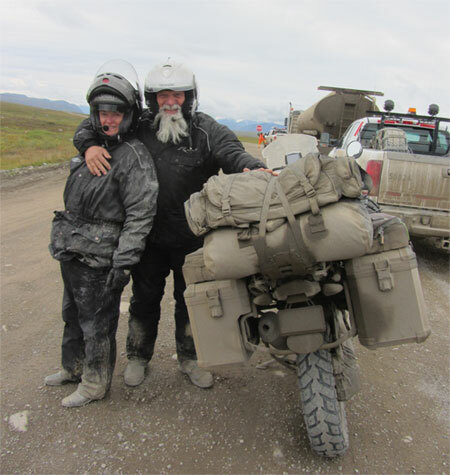 Brian has no doubt that riding on mud, clay, sand, salt flats and bush trails all those years ago will help when he rides across Siberia, through the wilds of Mongolia and the mountain passes of Tajikistan’s Pamir Region. Brian has the good fortune of having a wife who likes riding pillion and enjoys long distance trips too. Our other great leisure time passion is travelling. We want to experience everything we can. For every key stike you typed on a typewriter and later a keyboard, i hope you travel a kilometre. This applies to your days in the job as well as in your travels. Happy for you both…. I listened to many of your reports on ABC 774 over the last couple of years. I was delighted to wake up at odd hours and hear Shirley’s voice and I was able to visualise where her and Brian were. Congratulations on your marathon ride, and welcome home. What day/time are you returning to Melbourne? I’d love to ride the last few hours in with you if possible. Was great to meet you in Radium Hot Springs even if for only a few minutes. Your amazing adventure puts our short loop up to Revelstoke and Canmore puts things in perspective and I have no doubt that we’ll be scheming to see how we can do something a bit similar. Travel safe, travel well, and travel for the rest of us! Cheers from the Big Sky Country and where the River Runs Through It. Hope you were able to fit Going to the Sun and the Beartooth Pass into your adventures through here. It sounds like you guys are having way too much fun. Good luck on your travels. Glad to have met both of you in skykomish during lunch. I very much enjoy meeting both of you this weekend and here about your adventures ! I’ll get the photos I took, reduced down in size this week and email them. just saying gooday and hopng that this finds you both well and enjoying your trip. Hey guy’s happy waiting. Sue and I herd Brian on the radio again this morning, what a bugger the bike has not arrived, typical BMW JUST CANT GET THERE ON TIME. We view the couple of photos liked the one with the sign no fork trucks as the fork truck carries the bike in it;s crate. Well it is pouring home here and so you are cooling your heels in a good place rather than waiting for our summer. We hope to follow your journey and would like to keep in touch if that is Okay. Be safe Rod East and Sue Hahir.